In the previous tutorial you handled concurrency exceptions. 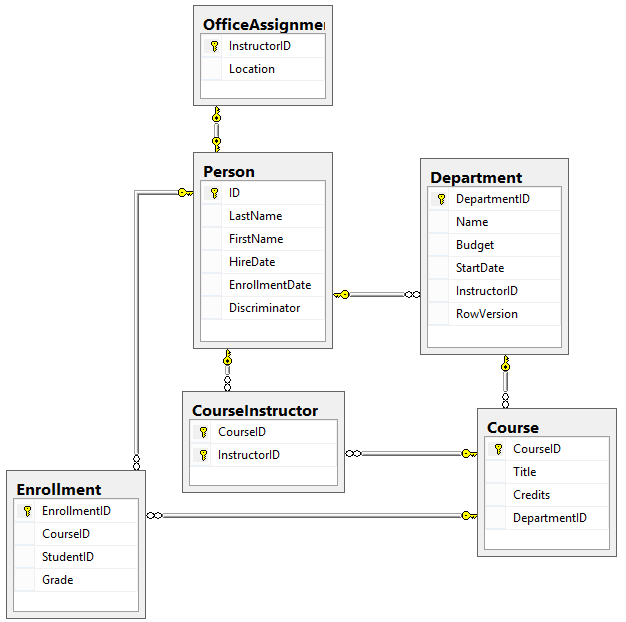 This tutorial will show you how to implement inheritance in the data model. In object-oriented programming, you can use inheritance to facilitate code reuse. In this tutorial, you'll change the Instructor and Student classes so that they derive from a Person base class which contains properties such as LastName that are common to both instructors and students. You won't add or change any web pages, but you'll change some of the code and those changes will be automatically reflected in the database. There are several ways this inheritance structure could be represented in the database. You could have a Person table that includes information about both students and instructors in a single table. Some of the columns could apply only to instructors (HireDate), some only to students (EnrollmentDate), some to both (LastName, FirstName). Typically, you'd have a discriminator column to indicate which type each row represents. For example, the discriminator column might have "Instructor" for instructors and "Student" for students. This pattern of generating an entity inheritance structure from a single database table is called table-per-hierarchy (TPH) inheritance. An alternative is to make the database look more like the inheritance structure. For example, you could have only the name fields in the Person table and have separate Instructor and Student tables with the date fields. 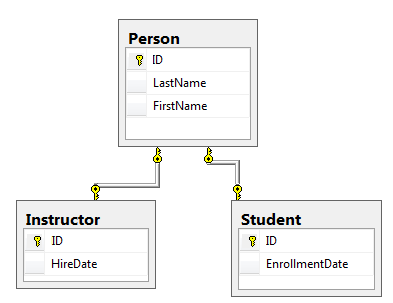 This pattern of making a database table for each entity class is called table per type (TPT) inheritance. Yet another option is to map all non-abstract types to individual tables. All properties of a class, including inherited properties, map to columns of the corresponding table. This pattern is called Table-per-Concrete Class (TPC) inheritance. 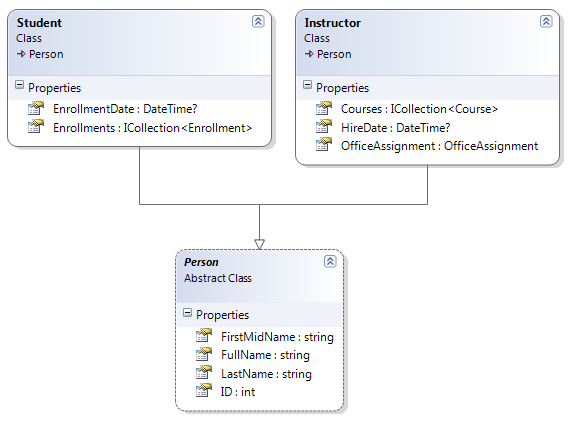 If you implemented TPC inheritance for the Person, Student, and Instructor classes as shown earlier, the Student and Instructor tables would look no different after implementing inheritance than they did before. TPC and TPH inheritance patterns generally deliver better performance in the Entity Framework than TPT inheritance patterns, because TPT patterns can result in complex join queries. Now update the Instructor.cs and Student.cs to inherit values from the Person.sc. This is all that the Entity Framework needs in order to configure table-per-hierarchy inheritance. As you'll see, when the database is updated, it will have a Person table in place of the Student and Instructor tables. Removes foreign key constraints and indexes that point to the Student table. Adds nullable EnrollmentDate for students. Adds Discriminator column to indicate whether a row is for a student or an instructor. Makes HireDate nullable since student rows won't have hire dates. Adds a temporary field that will be used to update foreign keys that point to students. When you copy students into the Person table they'll get new primary key values. Copies data from the Student table into the Person table. This causes students to get assigned new primary key values. Fixes foreign key values that point to students. Re-creates foreign key constraints and indexes, now pointing them to the Person table. Run the update-database command again. With a new database, there is no data to migrate, and the update-database command is much more likely to complete without errors. For instructions on how to delete the database, see How to Drop a Database from Visual Studio 2012. If you take this approach in order to continue with the tutorial, skip the deployment step at the end of this tutorial or deploy to a new site and database. If you deploy an update to the same site you've been deploying to already, EF will get the same error there when it runs migrations automatically. If you want to troubleshoot a migrations error, the best resource is one of the Entity Framework forums or StackOverflow.com. Run the site and try various pages. Everything works the same as it did before. 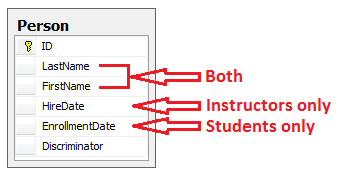 In Server Explorer, expand Data Connections\SchoolContext and then Tables, and you see that the Student and Instructor tables have been replaced by a Person table. Expand the Person table and you see that it has all of the columns that used to be in the Student and Instructor tables. Right-click the Person table, and then click Show Table Data to see the discriminator column. This section requires you to have completed the optional Deploying the app to Azure section in Part 3, Sorting, Filtering, and Paging of this tutorial series. If you had migrations errors that you resolved by deleting the database in your local project, skip this step; or create a new site and database, and deploy to the new environment. The Web app opens in your default browser. Test the application to verify it's working. The first time you run a page that accesses the database, the Entity Framework runs all of the migrations Up methods required to bring the database up to date with the current data model. For more information about this and other inheritance structures, see TPT Inheritance Pattern and TPH Inheritance Pattern on MSDN. In the next tutorial you'll see how to handle a variety of relatively advanced Entity Framework scenarios. Advance to the next article to learn about topics that are useful to be aware of when you go beyond the basics of developing ASP.NET web applications that use Entity Framework Code First.